Mario, Pokémon help 3DS outsell Vita by ratio of 10:1. Wii MMO Dragon Quest 10 has stormed to the top of the Japanese software charts, in another week ruled by sales of (and on) Nintendo platforms. The house of Mario shifted another 124,415 3DS consoles last week, around three-quarters of which were of the recently-launched 3DS XL model. In comparison, PlayStation Vita sales sunk to just 9038 units. 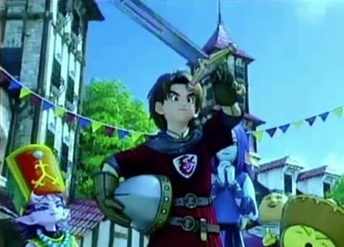 Dragon Quest 10 sold 367,148 units according to Japanese software company Media-Create (via NeoGAF). Famitsu's alternative numbers clocked the game at 420,000 sales instead - perhaps more accurate, if the discrepency is whether the game's Black Wii and Dragon Quest 10 console bundles were counted. Either way, it's still a big difference from the Dragon Quest series' previous major launches, which have racked up staggering sales of over two million copies in their respective launch weeks. Elsewhere in the software chart, New Super Mario Bros. 2 was second with sales of 213,000, down from 621,000 last week. Pokémon Black and White 2 was third, while in fourth place was the new Brain Training, which has possibly the longest video game name ever: Tohoku Daigaku Karei Igaku Kenkyuusho - Kawashima Ryuuta Kyouju Kanshuu - Mono Sugoku Nou o Kitaeru 5-Funkan no Oni Training. Eight of the top 10 games were on Nintendo platforms. No PlayStation Vita titles made the top 20. Cloud-streamed with a subscription fee. It's an "increasingly difficult" market. Create two siblings. Play as one of them. Dragon Quest 10 and Final Fantasy 13-2 teams "swap notes"
Yuji Hori's influence visible in 13-2. Is actually called Dragon Quest 10 Online.